Fleet Feet Sports has chosen the Henry Vilas Zoo as their charity of choice for The Power of Running Campaign. Hundreds of adults and kids enjoy this FREE zoo every day. Proceeds from events like the Zoo Run and Be A Kid Again, will continue to support exhibits and bring in new animals at this free local zoo. The Be A Kid Again event scheduled for Thurs, August 20th, is a night out (5:30-9:30pm) for adults only. The cost is $20, or $25 at the door, which will include all the fun kid things you enjoy at the zoo, but you can do it without your children this time! Come to Be A Kid Again and revisit your childhood with “grown-up” versions of kid activities. Get to know other young adult zoo-lovers in the community over food and drinks as you experience the ultimate throwback Thursday. 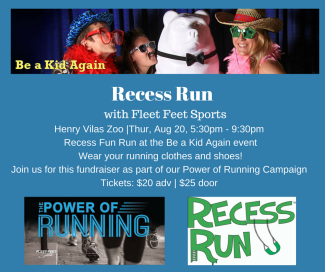 Fleet Feet Sports will offer a Recess Fun Run during the Be A Kid Again event, so dress in your running clothes and be ready for a fun Thursday evening at the Henry Vilas Zoo.